Swordfish Islands: What do they want? According to a personality profile at work, I fixate a lot on "what?" questions. I, being biased, think they're the best way to get to the core of an issue or problem which I believe is critical because if you don't know the core of the issue, you can't actually fix a problem or communicate the problem to those who can fix it. This focus on "what?" has spilled over into the Swordfish Islands, and because I'm apparently obsessed with being a maximalist, every intelligent creature type (and potentially significant NPC) has the following three lists: "What do they want? ", "What do they NOT want? ", and "What else?". The first two lists (want/not want) are short bullet points and will hopefully serve as a good quick reference for the GM in the heat of combat/parley. The "what else?" category is ultimately still a list, but provides more information on complex goals, long term goals, motivations and problems. 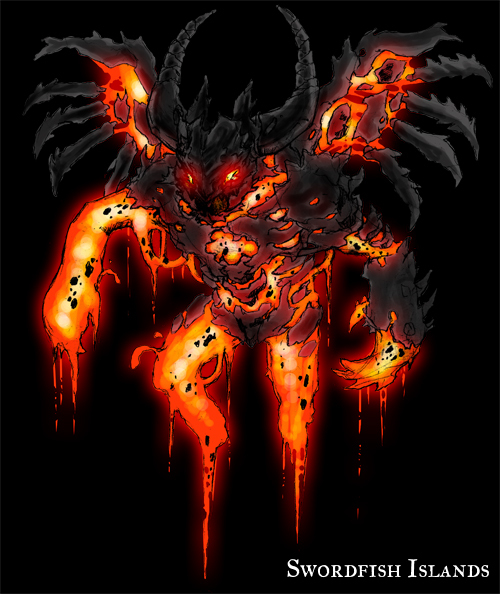 Here's the entry for Magma Imps. Magma imps work together like a ruthlessly efficient, highly professional pit crew. They relish the challenge of creation and its process, caring little for the object that is ultimately created. They do not like to see their stuff get stolen or destroyed, but they will probably give it away if asked. They love trading objects they have created for objects another creature has created and enjoy "talking shop". They do not like working on projects that are not their own (or their team's), but they are highly susceptible to being goaded into creating. "Oh yeah of course. It would be impossible to build a road across a lake of lava that a spiderbush could walk across without catching fire." Magma imps can become exceptionally snobby if they like something someone has, only to discover the person did not make it.